It’s Guest Blog Wednesday featuring Chris Gillett! Chicago has several great headshot photographers, and the king of Chicago, Michael Schacht, made this portrait of me, which is why it is the best photograph in this article. I was totally dejected and felt like I had failed my friend. I stared at the headshot I took of him trying to figure it out. He had a cool little mustache and looked handsome in his Army uniform, but Peter Hurley had just told me that he looked constipated. Faint smiles like this from Victoria take us into Mona Lisa territory. That such little movement can be so evocative leads some to conclude that the soul can communicate through the face beyond its mere physical appearance. My friend had joined the United States Army right after 9/11. It has not been the easiest life for him, and I am very proud of him. I so wanted to do a good job on his headshot, and it was tough to hear that, in the opinion of arguably the best headshot photographer in the world, I had failed. Hard as it was to hear, it was lessons like this from Peter that took me from a bad amateur with no ability to make people look good in headshots to a working headshot photographer. You may not like my work or you may find it too derivative, which is certainly okay. My purpose here is to praise Peter for his teaching ability and to strongly recommend the information contained in his new book The Headshot: The Secrets to Creating Amazing Headshot Portraits. We will always be responsive to those few square inches between the chin and forehead, and artists will always try to find new ways to stimulate that response. I met Peter in 2012 at one of his Headshot Intensives in Dallas, and it made a huge impact on my life. Peter shared everything he knew about taking headshots and running a business. No question was off limits. He taught things that I had never heard from another photography instructor. He looked over my shoulder as I was shooting and told me that my crop sucked. Most importantly, he began to teach me his eye. I started to see what made a headshot strong or weak. Consequently, if you took my portfolio images and arranged them in chronological order, it would be obvious where the Intensive occurred in the timeline. The impact he had on my work is still hard for me to believe and influences me every time I shoot a client. An artist must have a certain reverence for the human face. He also taught me how challenging and rewarding it can be to shoot headshots. Every subject has strengths and weaknesses. Everyone comes with a certain mindset and insecurities. The process is somewhat improvisational because what worked with the last client may not work with the next. If you are able to navigate these challenges and capture an image of someone at their best or make them see themselves in a new way, it is tremendously rewarding. Through Peter I learned how powerful a headshot can be, and I learned to revere the human face. Thanks to Peter’s lessons, I now have a headshot business in Houston where I work with individual professionals and politicians and their consultants to create headshots that convey their desired message and don’t make them look constipated. You know, when you put it this way, it seems pretty good. It is amazing to me that a guy who is arguably the best at what he does would have the desire and ability to teach his methods to other people. I think that part of it is that Peter genuinely enjoys teaching, but part of it also is that he is a tremendously generous person. If you just know the crazy guy from YouTube or The Grid, you don’t know him at all. He is one of the kindest people I know. I think Jerry Ghionis falls into this category too: world class skills with the desire and ability to teach them rather than simply demonstrating what he does as so many other folks seem to do. An aptitude, whether instinctive or learned, what some call an “eye,” often marks the difference between artistry and mere competence. I have heard instructors struggle to explain how to develop one’s own style. I don’t think it is actually that mysterious. A perhaps simplistic but accurate definition is that one’s style is the sum of each choice that is made in the creation of the work, things that the artist likes and doesn’t like. Peter seems to understand this, for a big part of his teaching style is to simply show you what he thinks looks good in headshots, what does not, and why. For example, Peter generally likes clean neck lines in headshots (see pages 154-155 of The Headshot). It is one of the factors that defines his style. While his style or his eye is not simply the sum of all his opinions about headshots, it is still a useful definition. This is one way that he taught me and many others his photographic eye. Peter generally dislikes hair behind both shoulders like this. See page 151. While I agree, I think it works here. The Intensive is an amazing experience, but not everyone will be able to do it. Fortunately, Scott Kelby forced Peter to write The Headshot. 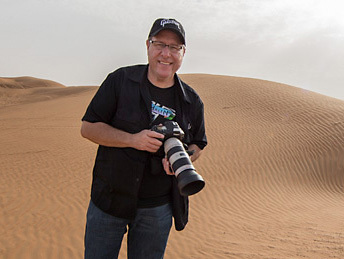 Peter has said that writing the book is the hardest thing he has ever done, and portrait and headshot photographers are lucky that he did, for it teaches all of the hard won lessons he has learned over the last decade that have made him one of the best known headshot photographers in the world. These lessons put me a decade ahead of where I would be otherwise. The book is packed with very specific information about what he likes, what he does not like, and why. It is a very clear map to developing his eye. Whether your goal is to shoot in his style or simply take better pictures of human beings, The Headshot has the information to get you there. Another example of Peter’s eye, which he mentions in the book, is the hair wrap (see page 155). Often when women with long hair are asked to pull the hair on one side behind the shoulder, they reach around with the hand on the opposite side and wrap the hair over the opposite shoulder. In another type of photograph, this might be fine, but in a headshot it often looks unbalanced and throws the composition off. To me, it also looks too casual, which is not the look I am usually going for. There are more emotional qualities possible with a smile than any other expression. Peter also discusses making your clients feel comfortable, but he is not offering the same hoary advice that you have probably seen many times in articles with titles like “Top 6 Portrait Tips.” If your clients are not comfortable around you, then you may have a problem that exists outside of photography. Peter digs deeper into what causes people to be self conscious and uncomfortable in front of a camera and he offers specific strategies to deal with it. I have not seen his solutions anywhere else. For example, he discusses camera invisibility, establishing rapport, and getting life out of lifeless subjects (see Chapter 5). With a slight smile, the difference between engaging and vacant is often difficult to navigate. I think the most valuable thing he teaches is his eye for expression. It is his ability to get compelling expressions out of his subjects that is most striking about his work. There are experienced pros who have headshots in their portfolios with dull, lifeless, and vacant expressions. I am not sure if this is because they cannot get better expressions, don’t know the difference, or just have different opinions about what makes a compelling headshot. Getting compelling expressions out of your clients is not easy. Imagine how hard it is if you don’t know what the goal is (see Chapter 4). Expression is difficult because subtle movements change everything, and they are difficult to direct. Also, expression is open to interpretation. Sometimes the difference between vacant and engaged is a few millimeters. In the example below, you can see that the subject goes from blank to compelling by squinting her eyes a bit and smiling slightly. Enthusiasts will note that I am shooting way too high on her. See page 20. Maybe she snuck her shoes off when I wasn’t looking. You don’t know. Obviously I like small squints and tiny smiles a lot. Rather than trying to direct micro expressions, I have had good luck getting people to react to what I say. I don’t do it exactly like Peter does. I have to do it in a way that fits my personality. However you do it, it must be with confidence (see page 167). After submitting a draft of this article, I ran across a thread on Reddit regarding a piece on Rangefinder Online called “10 Tips from Headshot Master Peter Hurley on Shooting Female Faces.” I was very surprised by the comments in the Reddit thread. About half of the commenters (I didn’t count; this is a guess) voiced criticisms of the shots that accompanied the article that demonstrated they may not have noticed how good the expressions were. For example, some criticized the technique and style: “The pictures look like generic stock photos;” “They’re product shots of faces;” (That one IS hilarious) “I can’t think of a more boring type of photography;” and “Am I the only one thinking that those shots look neither professional nor good?” While I would argue with all of these comments, the point is that none of the commenters seemed to appreciate that a strength of the shots (I would argue the main strength) is the expressions. Yes they are all the same style, yes they are lit very flat (Hurley lights men differently), yes he takes pictures over and over again of people’s heads in a clean style. However, the salient characteristic is the excellent expressions Hurley gets. Amazingly, he wants to tell how he does it, but a lot of people are deaf to it. Or blind to it. Pick your own metaphor. One commenter called people like me Hurley clones. As you can imagine, I would love to be a clone of Hurley. Of course when I go to the commenter’s website, the first image I see is of a girl who looks very unhappy to be in a forest. Another commenter posted numerous links to examples of what he considered better headshots. There were a couple I liked. The rest were either not headshots (I once had someone call me to inquire about taking “full length headshots,” whatever that is) or had terrible blank, vacant, miserable, or deer in the headlights expressions. I know it is very popular to take pictures of pretty, young women who look like they have been medicated or hypnotized. I am not saying folks shouldn’t do that (photograph those looks, I mean… You shouldn’t be medicating or hypnotizing your subjects). All I am saying is that there are other possibilities, and Hurley teaches some in the book. Forlorn might be a useful look for a twenty year old model, but the people who hire me have no use for that. They want to look pleasant and poised, but they have no idea what that looks like or how to pull it off. Many models don’t know either. That is why I am so thankful that Peter taught me how to do it and why I think the book is worth reading. My point in writing all this was to point out the value of compelling expressions in people photography. I don’t know if I did a good enough job, but I hope it opens someone’s eyes to an aspect of portraiture that they may have not yet explored sufficiently. If you photograph people, I strongly recommend that you read The Headshot. It is a competitive advantage. You could also check out Peter’s teaching site HeadshotCrew.com. Warning: if you start to see people through Peter’s eyes, a lot of photographs of people will be ruined for you. You will never be able to unsee the blank, miserable, and vacant looks that still end up in published work, but your work will be better for it. Chris Gillett is a Houston-based headshot and portrait photographer. You can see more of Chris’ work at LikeTheRazor.com, and follow him on Facebook, Twitter, and Instagram. Another great tribute to the genius of Peter Hurley. Well put. This is how I like to describe Peter’s gift: He reaches into your soul and pulls out the real you and photographs it on your face. I love that! Thanks for taking the time to share it. The art in a headshot, is that the viewer is alerted by their sense of judgement and told “You want to associate yourself with this person”. It’s the eyes and smile reflecting the positive of their personality. People want to be with the quietly positive people out there, a good headshot points them out. Good article Chris, thanks for taking time to write it. Man, that is a great way to put it. You should have written this! Great article Chris. You’ve summed up a lot of great points there that I totally agree with. Ha! You would know. Thanks, man. I got to read this 1st thing in the morning. Great way to start my day and prep me for another shoot! Thank you so much for sharing this knowledge. Thank you, brother. Return the favor sometime; I need the help. ‘Twas my pleasure. Don’t think I didn’t see your “He once took a blurry headshot, just to see how it feels” line in the Free Stuff Thursday comments. I snorted my drink a bit. I love it. It would be cool if you could photograph Hurley like this and make a real “most interesting photographer in the word” meme. Maybe the Kelby people will do it. Thank you! When I heard “full length headshots…” I was like ?| ? ? ? |? Great writeup! I looked into that “10 tips” post you’d mentioned that Redditors poo-pooed and I am pretty much in LOVE with a few of the people in those Hurley headshots now. WOW. I mean, I’ve seen Peter’s work before, but some of the models on that post were jaw-droppingly gorgeous, and with Peter’s ability to direct and capture those expressions… I’m just all aflutter. I want to do this for EVERY one of my clients. ?_? ? Tears of joy. You made my day. I am with you. I feel like if I do my job right, my client will see themselves in a way that they haven’t before and maybe even see something in themselves that they haven’t seen before. As you and I have been fortunate to discover, this stuff is way more than the gear or the technical aspects or how cool the style is. It is about the people, and that is pretty rewarding. I received your email <3 Thank you so much. YOU made my day. How did I miss this blog post???? Excellently said, Chris! Learning from Peter was one of the highlights of my life and, as you say, completely changed the way I look at every face now. It really wasn’t until I did that, that I realized just how much I love have someone in front of the camera, how much I love having the inner person come out in their expression. I continue to be in awe of both Chris and Peter. And thanks to Peter, I now cannot help but do what I must do. Paul! Thanks, man. I urged them to pour a lot of money into promoting this post, but the week before, Scott was using a Variac to push his Marshall stack in the office, causing some expensive electrical damage.